Don Walker es profesor de química de la Universidad de Boise. Boise es un referente constante cuando hablamos de los vascos de la diáspora en Norteamérica y en su Universidad nos encontramos con uno de los Centros de Estudios Vascos más importantes que hay fuera de las fronteras de Euskadi. No es extraño, por tanto que este profesor haya escogido Bilbao como destino, en un viaje familiar, para realizar clases intensivas de castellano, ya que eso le permite conocer, muy de cerca, los orígenes de una cultura que es fundamental en la construcción de la sociedad donde vive: la vasca. am writing my first blog entry directly from Bilbao, Spain. It is Sunday evening—just before 11:00 pm local time (which means that it is almost 3:00 pm in Boise). We (my wife and 2 kids traveled with me) arrived in Madrid on Friday evening after a full 24 hours on airplanes and in airports. We spent all day Saturday walking around Madrid, and then caught a bus to Bilbao on Sunday morning. We have settled into our apartment and had an opportunity to take a short walk around the city and play on the beach a bit. 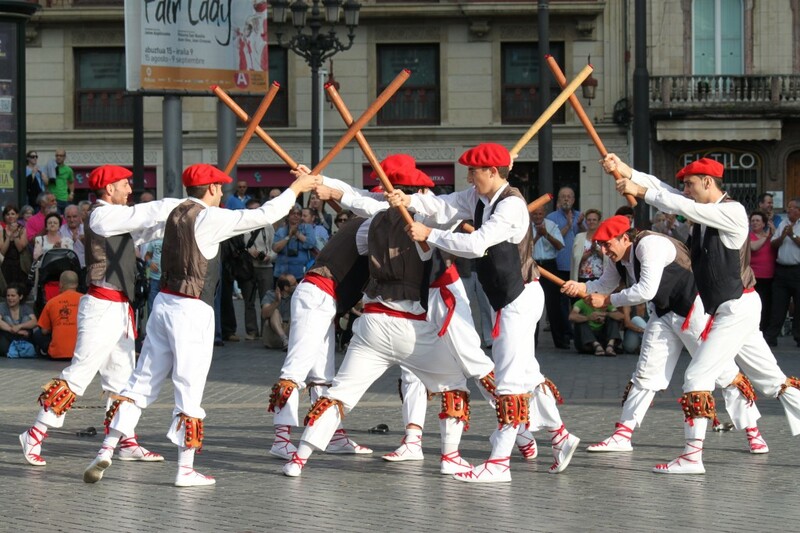 Basque dancers performing in Bilbao in Arriaga Plaza, which is in the older part of town. One of the dances the men performed was almost identical to one performed by the Boise Basque dancers at the American Chemical Society meeting that was held in Boise several weeks ago (although the music was quite different). We’ve been in Spain a week and a half. Time flies! My Spanish class is more intense than I thought it would be (we are in class four hours per day, five days per week), but I feel like I am learning a lot. There are only seven students in my class, and the teacher is very good. I am studying hard so that I can take full advantage of this opportunity. I had my first quiz on Tuesday, and a midterm today, so we will see how much I am retaining! Another week has flown by! I’ve been working hard to learn the conjugations of irregular Spanish verbs (my midterm exam went well, in case you are wondering). I’ve made many trips to El Corte Ingles (a big department store) to buy packs of index cards. Each time, I’m sure I’ve bought enough for all the flashcards I need to make, but it seems it never is! One of the things I really enjoy in my class is that my teacher shares stories about Spanish culture and her life. She’s talked about the trusting culture that exists here (for example, a pharmacist will give you medication before you go to the doctor, if you say you’ll bring your prescription back), but she worries that it is changing. I appreciate so much all that I am learning. I left Bilbao about a week ago, and I’ve been very busy since then. I did, however, want to take the time to write about my last week in Bilbao. In addition to the regular studying and learning new material, I had to prepare and give a presentation to my class, which I found quite stressful. We could choose any topic we wanted, so I decided to share about some of the travels I’ve taken with my family (if anyone has ever taken first semester organic chemistry from me, you may have seen a similar presentation in EnglishJ). The fact that this one had to be in Spanish was the stressful part! I also wanted to make sure I did everything I wanted before I had to leave, and that included seeing some new sights and revisiting some favorites.